Stockwell Elastomerics supplies silicone sheet materials and custom silicone parts to commercial and industrial markets. While Stockwell Elastomerics does not supply uncured or semi-cured silicone sheets for the construction of flexible heater, silicone foam and silicone sponge sheets are sold as insulation backers to the flexible heater / silicone rubber heater markets. 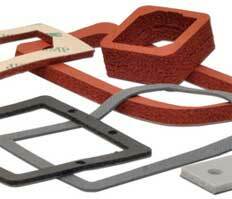 These high temperature foam backings help improve heater efficiency by reducing heat loss. Heater foam insulation from Stockwell Elastomerics may be permanently bonded with silicone RTV or tacked in place with DP-1001 peel and stick backing. Silicone Foam Sheet Insulation – has an operating temperature of 200°C (392°F) with intermittent exposures to 250°C (482°F). Open cell silicone foam (BF-1000) – very good insulation and has a UL 94V-0 flame rating. Thermal conductivity = 0.06 W/m-K.
Closed cell silicone foam (HT-800) – good insulation, UL 94V-0 flame rating and water resistance. Thermal conductivity = 0.09 W/m-K.
UL 94HB and UL 94V-0 flame ratings. Typical thermal conductivity = 0.11 W/m-K.
Silicone sheet insulation is available in a wide range of thickness and sizes. Stockwell Elastomerics offers heater insulation materials in sheets or rolls 36” wide; custom cut insulation pads are also available. Additionally, Stockwell Elastomerics offers silicone sheet materials with or without adhesive backing. High temperature silicone adhesive or moderate temperature acrylic adhesive backings are available too. For more information about silicone insulation sheets for silicone rubber heaters and flexible circuits, please contact Stockwell Elastomerics at service@stockwell.com or 1-800-523-0123.